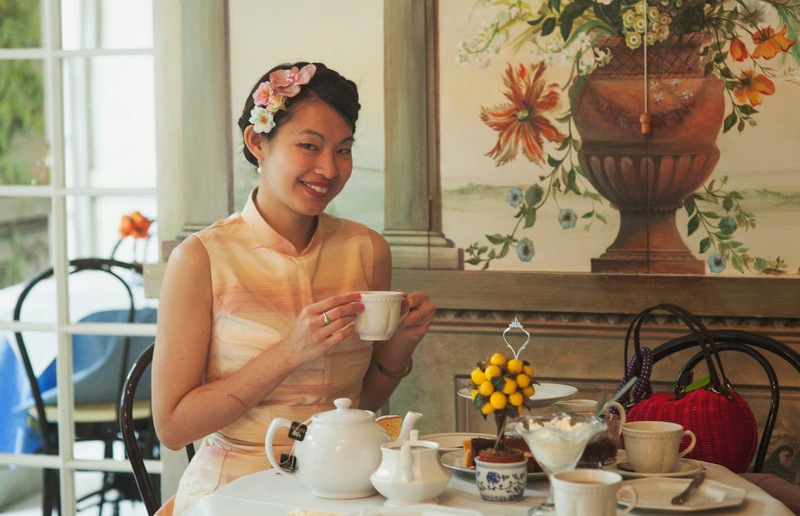 London Hot-Spot/LookS: 1950s Braided kitsch in the Fan Museum...for best value Afternoon Tea! 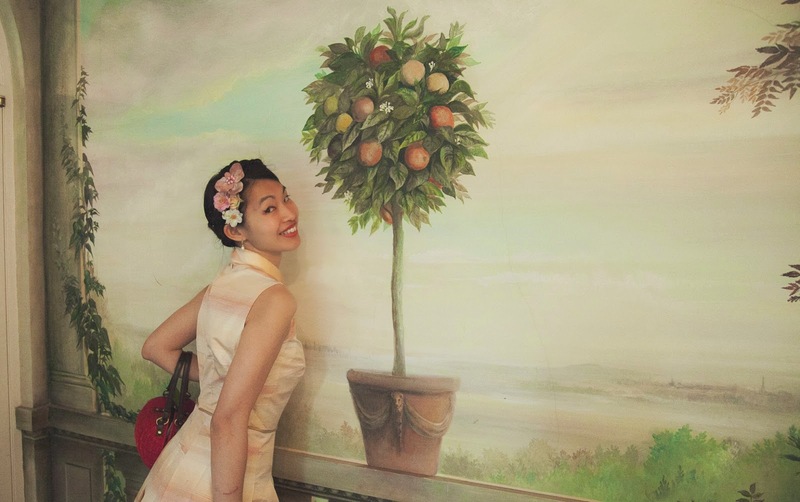 'Kyoto in Sunrise'....Walking in May EXCLUSIVE Cheongsam by the Lady General. As I excitedly jump on the spot...I am happy to tell you lovely darlings that it is finally time to reveal my very special Walking in May EXCLUSIVE Cheongsam (Qipao) from the Kimono X collection by The Lady General; a specialist Cheongsam online shop based in Singapore who prides themselves on re-inventing the Qipao! If you darlings have seen the whole collection of Kimono X dresses on The Lady General's online shop, which includes two different styles named Kyoto and Osaka, you might be wondering why you haven't seen this particular dress that I am wearing here? The Osaka (here) range was made from plain modern Japanese Chrimen crepe fabric with a vintage kimono Obi belt and flared out skirt. 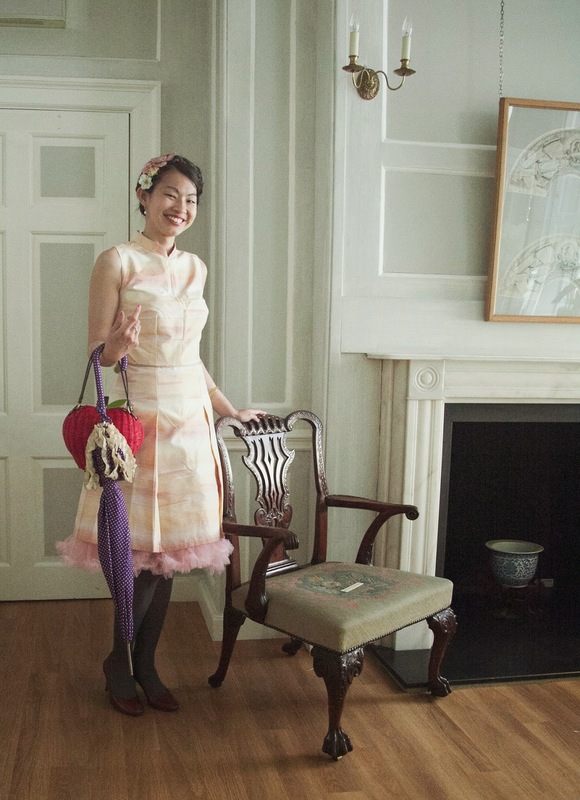 Whilst the Kyoto range of Cheongsam dresses were made from various patterned vintage Japanese kimono fabric and share the Obijime corded waistline with a pleated bottom, which resulted in the Kyoto Cheongsam in 'Cloud' (here), 'Floral' (here) and 'Poppy' (here). 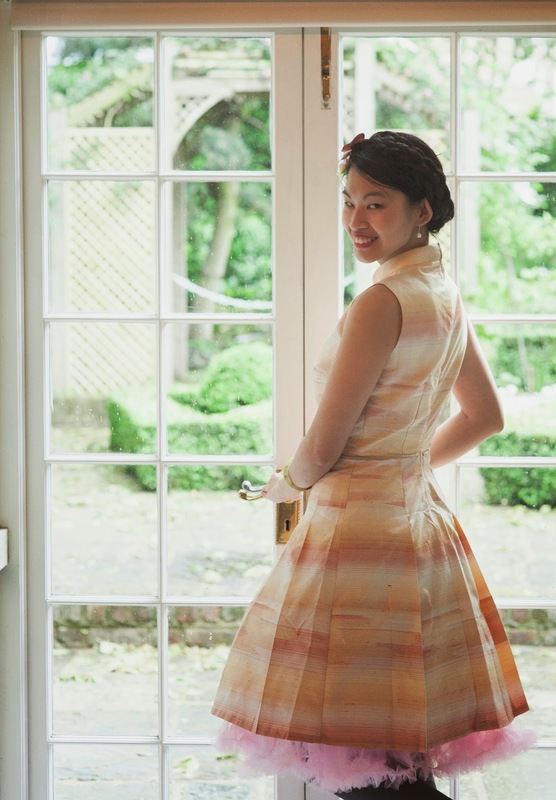 Well...I am delightedly proud to introduce you darlings to 'Kyoto in Sunrise' (or golden 'Sunrise' as I have nicknamed her), which happens to be the one and only dress of her kind. As a whole vintage kimono bolt was used to make this one single unique dress, so there is only one dress for the 'Kyoto in Sunrise' style....I hear you cry 'why'? Traditionally in tailoring of the Qipao, as they were often custom made, it is usually made from one whole piece or bolt of unbroken fabric. One of the most valued skill in Qipao tailoring is the ability to utilise cut pieces of fabric in matching the pattern so perfectly that it seems like an unbroken whole piece, and only under closer examination can it be realised otherwise....which is a testament to the 'Mother and Child' project that handmade the garment.....such is the magic of my beautiful 'Kyoto in Sunrise' Cheongsam. Afternoon tea....yummy cakes and scones.....Fan Museum, London. A 1950s inspired Swiss braid up-do....it's all my real hair! Unique, beautiful and delicate are the words that come to mind when I think of the Fan Museum in Greenwich, London. Being the only Fan Museum in the world, the private collection of valuable fans do bring a 'Wow' element that will stop you in your tracks to admire lace, diamonds, wood-craft and even the great Dali....I shan't say too much as it really is an exhibit to be seen for yourselves! But I will say that if you do wander into the Fan Museum, then do make sure to take afternoon tea at the beautifully painted Orangery. 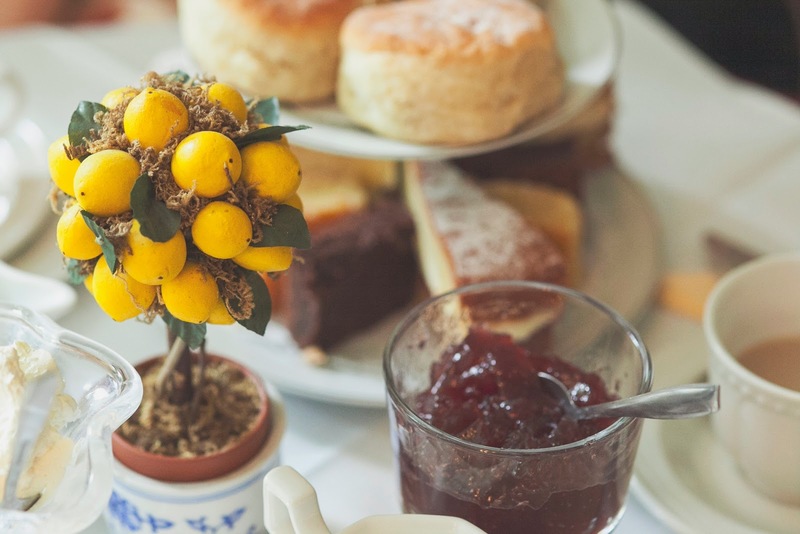 Not only are the cakes scrumptiously yummy, though simply without fuss in service as well as a limited tea selection, it is also of a very reasonable price...which is no wonder how they won a 'Best value for Afternoon Tea' award. Inspired by the simply flared out pleated skirt and taken-in corded Obijime waistline, I created a 1950s kitsch look....with Swiss Heidi braided hair covered in a puzzle of flowers I placed together like a mini-hat, natural cream pearl earrings, pink fluffy petticoat, slightly high stiletto signature red heels and the adorably delicious red wicker Ollie & Nic Apple bag. 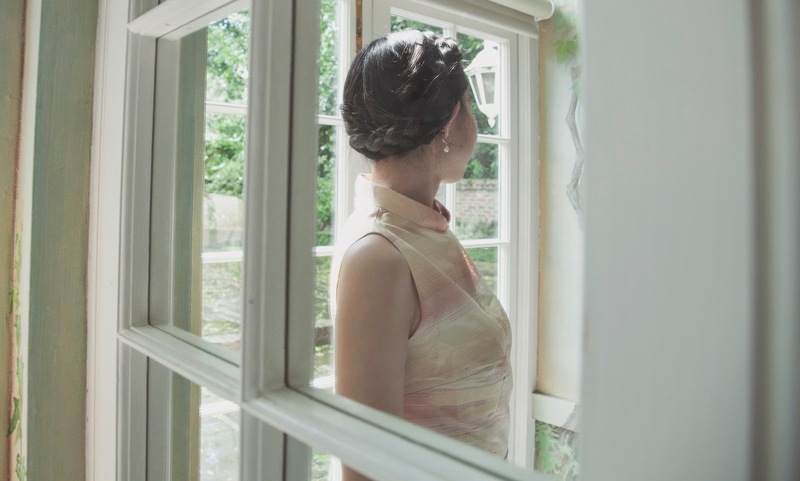 In fact it was not unusual to wear one's hair up in tidy braids or plaits close to the head since the 1940s, and it is a hairstyle that definitely existed in the 1950s. [Find out more about the history of braids here on Huffington Post.] With my hair being past the waist in length, my friend Rachael had commented that I should try the Swiss Heidi braids...and so I took to the challenge. 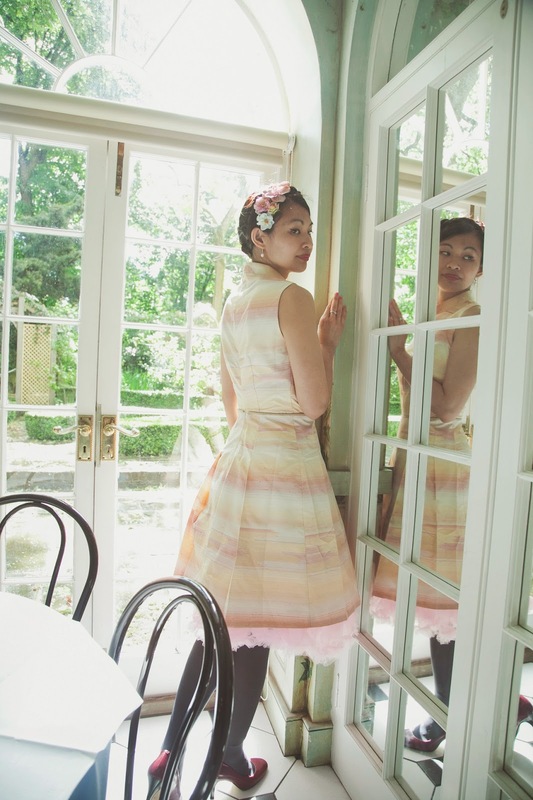 Once ready, I felt like an imaginary character born of Alice in Wonderland meeting little Bo-peep....somehow magical and somehow oddly cute, but comfortable loved in the soft vintage silks of pretty pastels in Sunrise. The beautiful painted walls of the Orangery, Fan Museum, London. A giant is standing next to the chair! Inside the Fan Museum, London. Last but not at the very least, this post has been linked-up with the lovely Sacramento's Share-in-Style project (Guidelines) which is all about celebrating creativity in style! This time the theme is 'Gold' (link) and I am joining a group of bloggers in interpreting or putting my own creative stamp on the theme.....with my beautifully unique golden 'Sunrise' Cheongsam by The Lady General. Also there shall be a very exciting thing happening next week, come Monday I will hopefully be able to tell you all about it....but for now, have a fabulously sunny weekend my darlings! What a delightful post! Full of delicate grace!! Your outfit is lovable and you are a wonderful ( and elegant ) lady!! very happy to have discovered your blog! adorable dress and beautiful pictures! love it! So gorgeous May! 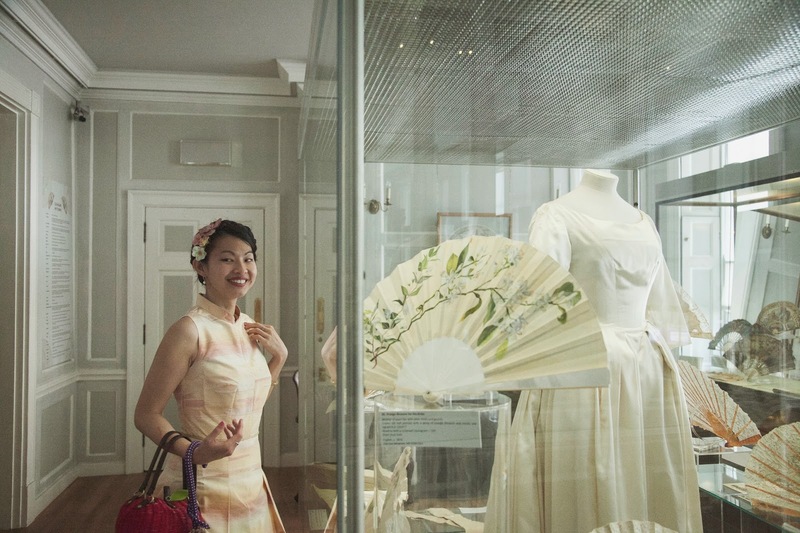 You can wear *any* cheongsam style it seems :) The photography is an absolute joy to view! That is such an elegant outfit! And thanks for sharing the info on this interesting museum! Amazing look! The dress, the flowers, the bag....Lovely!!! You are special, dear Lady! I love absolutely everything about this outfit, the bag, the dress, your hair ... your smile ... you are delicious! Thanks for joining us in this Share!